Lifeline is the Joe team’s Rescue Trooper (sounds better than medic I guess). He’s actually the vintage line’s second medic. The first was Doc, released in 1983. What I find most interesting note about Lifeline is his portrayal as a pacifist in the comics and cartoon. However, his action figure included a pistol, and his card art prominently showed him brandishing it. This figure continued the trend of more accessories started the previous year, with an EMS kit and oxygen mask. Also notice that Lifeline doesn’t have a red cross on his uniform or equipment. Instead he has a red circle with white stripes. 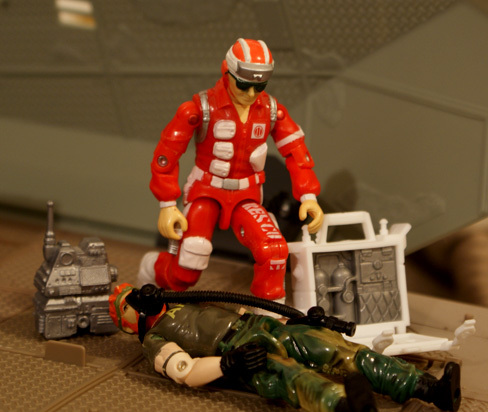 Could it have been an issue with the American Red Cross not wanting their symbol on a modern military toy? Lifeline’s pacifism was so prominent in the cartoon that when a fellow Joe extended a rifle to help him out of piranha infested waters, he would not grab it. Talk about dedication to your ideals! To make this character’s use of weapons more confusing, the figure was re-released in 1991 as a Kelloggs Rice Krispies cereal mail-in (yes, another mail-in mention). Kelloggs did not want to use a figure with weapons in its promotion, so Hasbro did not include his pistol, and even substituted the legs with another figure that did not have a molded gun and holster on the hip. Lifeline now had a figure that reflected his pacifism. I love this figure. 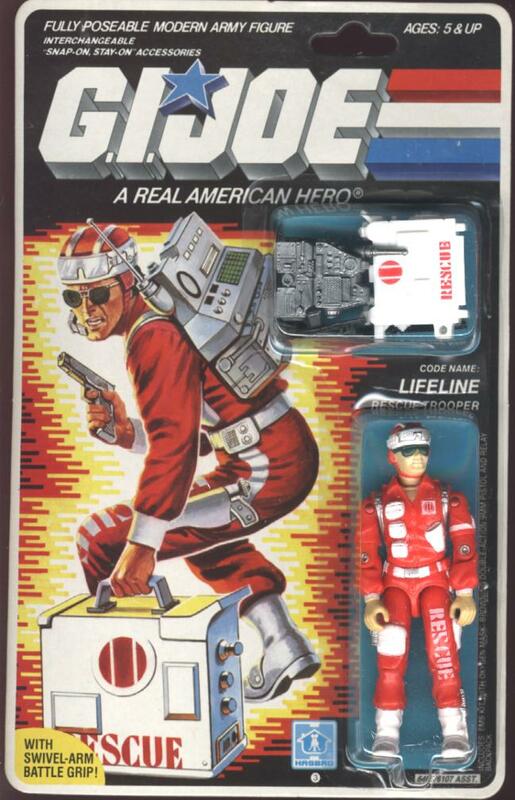 A friend of mine in 7th grade told me one day that the new ’86 Joes were out and that Lifeline looked particularly awesome. So I gave him some dough and he got the figure for me. We made the trade in the coatroom before class began, I believe. That was a sweet day for me. I had two of the mail-in versions and I hated them since they didn’t come with any weapons and even the guns details weren’t painted on them. I always had them getting beat up and shot full of holes in every battle. I never had this one, but it’s a classic.